In 2014, the Metropolitan Water District of Southern California (MWD) undertook an unprecedented investment to incentive turf replacement throughout Southern California in response to the state’s serious drought. MWD devoted $350 million to the program, resulting in more than 46,000 rebate payments to remove 165 million square feet of turf. The funding boost served as a tremendous natural experiment to better understand the effects turf replacement programs. 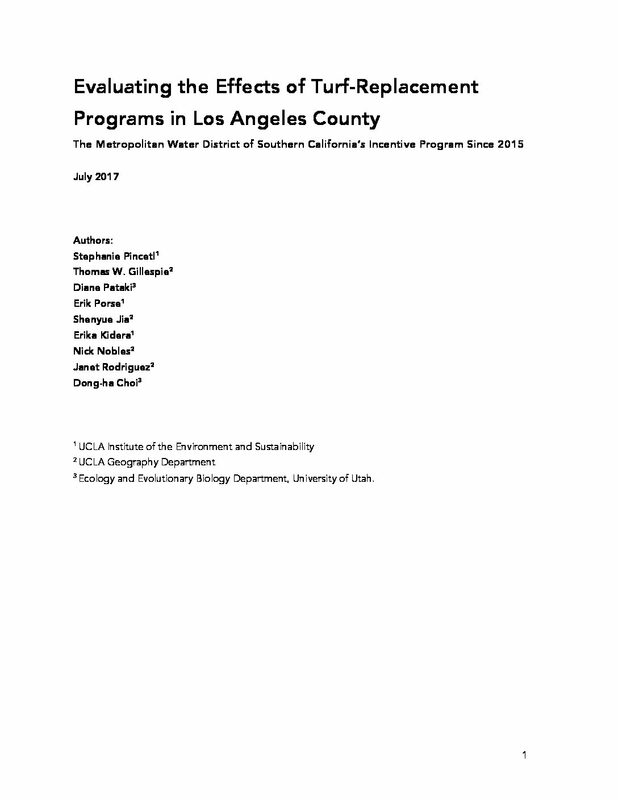 As part of an evaluation of this program, UCLA and the University of Utah examined socio-economic and demographic characteristics of program participation and assessed changes in vegetation and landscapes of front yards resulting from turf replacement. 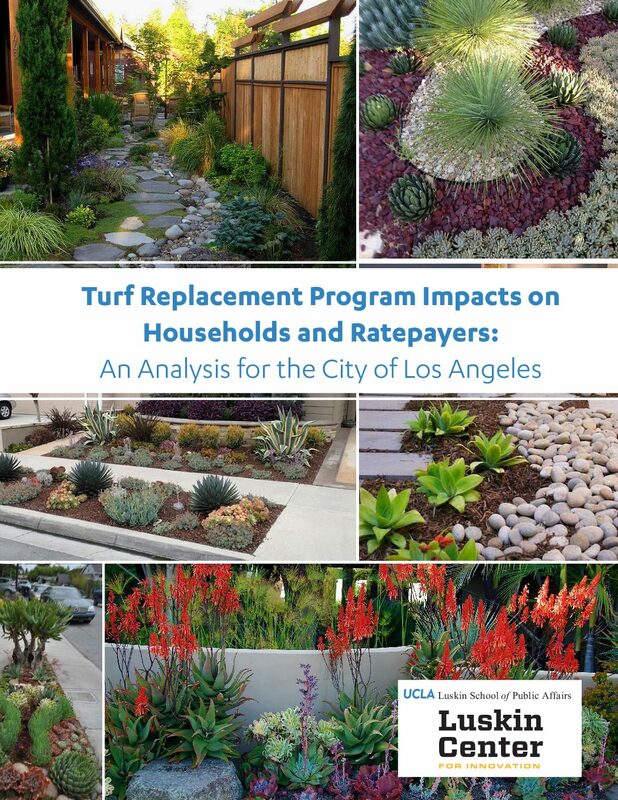 We examined address-level records of 24,921 participants who applied for turf replacement rebates between February 2014 and April 2016 in Los Angeles (LA) County. We analyzed the socioeconomic and spatial determinants of program participation. Further, we used Google Earth Street View to characterize the landscapes and plants resulting from turf replacement based on a set of randomly selected participating properties. We ascertained the types of turf replacements that were installed and developed a classification system for landscape design types. Ongoing severe drought and climate change continue to strain the Los Angeles region’s water supply and have forced the City to institute water savings goals (Garcetti, 2014). Turf replacement programs, which aim to encourage residents to replace their lawn with less water intensive landscaping, may offer benefits as part of a larger package of conservation measures. More than half of residential water use is allocated for outdoor watering (approximately 54%) (Firestone, 2015). 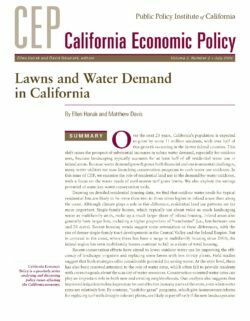 Outdoor water use is typically considered discretionary while indoor water use is generally considered essential, making outdoor water use a good target for conservation efforts. In order to encourage turf replacement, the city launched a turf replacement program in 2009. Commercial and residential customers can receive a rebate from the utility when they replace their lawns with less water intensive landscaping. Currently, the city is offering a rebate of $1.75 per sq. ft. up to 1,500 sq. ft. This report seeks to answer two questions regarding the turf replacement program. First, under what conditions does participation in the turf replacement program provide financial benefits to households? Second, is the turf replacement program a reasonably cost effective investment for utilities and ratepayers?